In the aftermath of World War II, the United and Soviet Union became engaged in a protracted standoff, a Cold War that became hot on several occasions. In the eyes of Washington, Soviet expansion of its communist and Marxist-Leninist beliefs, were a threat to democracy and had to be stopped whenever possible. Every conflict involving a communist government was seen as a pawn of the Soviet Union and a direct affront to American dominance. In 1953, an armistice was signed ending the Korean War, giving the world cause for relief as a major world war was averted. Twelve years later, American troops were once again dispatched to an Asian nation, this time 13,000 miles away from home to the jungles of Vietnam, a country that many of them had never before seen. The war in Vietnam claimed the lives of fifty-eight thousand Americans and over one million Vietnamese. The withdrawal of American soldiers from Saigon in the 1975 resulted in a power vacuum in which the North Vietnamese government seized the opportunity and reclaimed its position in the southern part o the country, eventually unify the Republic of Vietnam. Saigon was later renamed Ho Chih Minh City in honor of the late leader of the Democratic Republic of North Vietnam. On September 2, 1969, Ho Chih Minh died at the age of seventy-nine as the war raged on. In death he would be vindicated as unification was eventually achieved and Washington was forced to acknowledge the communist government. The war had ended but for many veterans and civilians, the pain and dark memories continued to many many years. My uncle served in Vietnam and to this day he does not speak about the things he witnessed as a combat infantry soldier. For him and thousands of veterans, Vietnam is part of their lives that they can never forget. For America, it is perhaps our darkest moment in the execution of foreign policy. As we look back on Vietnam, we are forced to confront many demons surrounding the involvement of the United States military in Southeast Asia. A war with no clear objective and doomed from the start, transformed an entire nation, deeply divided over Washington’s continuous blunders. To some it seems completely illogical that America began a crusade to begin with. For the war hawks, it was an opportunity to flex American muscle. In hindsight, we can now see that American troops were never there to win and the White House kept hidden from the public, an endless number of important revelations that signaled failure from the very beginning. The blame for Vietnam does not lay with one person alone but rather an entire cast of characters including four presidents. Robert McNamara (1916-2009), served as Secretary of Defense under Presidents John F. Kennedy (1917-1963) and Lyndon B. Johnson (1908-1973) and has been referred to as the architect of the war. In fact, the conflict is sometimes referred to as McNamara’s War. The belief that one man was responsible for the war is misguided and ignores the abundance of information revealed in The Pentagon Papers, and other sources of critical information. In 2003, McNamara sat down with filmmaker Errol Morris in the critically acclaimed documentary “The Fog of War”, in which he tells his life story and answers very direct questions about his role in Washington. While he does speak on Vietnam, he refuses to give into the claim that he was the person responsible for the escalation of U.S. ground troops. Some viewers will undoubtedly be disappointed with the lack of a detailed response to some questions but overall, the film is highly enjoyable and even in his later years, McNamara’s memory was still quite sharp. 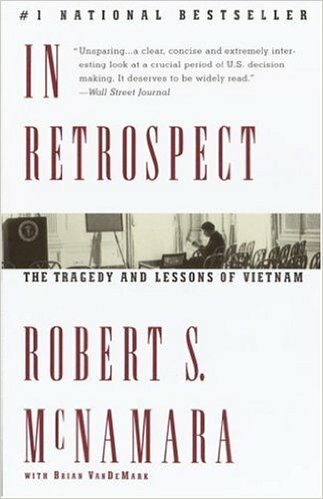 Times, locations, faces and conversations are easily recalled with near pinpoint accuracy, second only to this book which he appropriately titled “In Retrospect: The Tragedy and Lessons of Vietnam “. The story is part autobiography and historical record of his career, in particular his service in Washington during two administrations. He carefully recounts the decisions that were made behind the scenes as the White House under President Kennedy grappled with looming advance of North Vietnamese troops against its southern neighbor ruled by a highly unpopular government that was unable to win support for its cause. Today, we know that at no time did South Vietnam have a stable government to resist the North. The assassinations of the Diem brothers two weeks before Kennedy’s murder, set the stage for the next battleground where America would unleash its fighting machine. And yet the question remains, why? McNamara asks himself that same question and here he attempts to finally put to the rest rumors and misstatements so that we can understand Vietnam’s tragedies and lessons. He comes across very frank in the book but there will always remain the question of how much did he refrain from saying, possibly due to the sensitive nature of the subject and possibly to avoid legal action by the U.S. Government. Putting that aside, he does go into great detail about several topics, showing the deadly mistakes that he and his superiors made as Vietnam became the crisis that would not go away. Some readers will undoubtedly feel that McNamara should accept more blame than he does. To many, he is seen as the brain behind the operation and the whiz kid with all of the facts. Kennedy had prided himself of bringing together what David Halberstam called The Best and the Brightest. Indeed, the President’s cabinet was filled with some of the greatest minds to ever work in Washington but tragically and regrettably, mistakes and error in judgment allowed even these great minds to further escalate tensions in Vietnam and plunge American into its most unpopular war. The book can be seen as a sort of apology by McNamara for his role at the time but I did feel that there was more he could said to show his full regret. I do give him credit for being able to point the finger at himself and accept his share of the blame for the death and destruction that became the ten year war in Vietnam. Notwithstanding, the book is a good read and helps the reader understand where America went wrong in Vietnam. Posted on August 26, 2015, in Vietnam War and tagged Robert McNamara. Bookmark the permalink. 1 Comment.